The inventor and noted author believes the key to such a scientific breakthrough is a system of ‘bridges’ that enable the body to move from strength to strength over time. 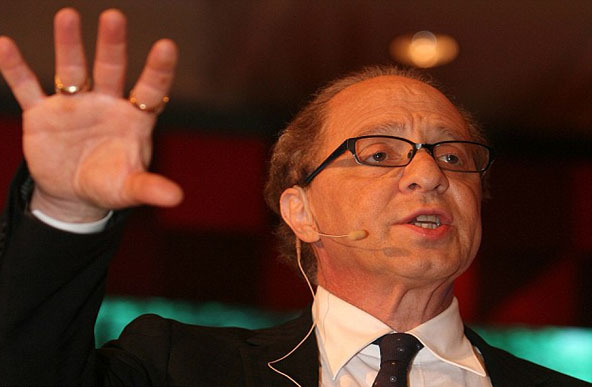 In an interview with Canadian magazine Maclean’s, Kurzweil says he hopes the supplements will keep him healthy enough to reach the ‘nanotech revolution’. ‘I can never say, “I’ve done it, I’ve lived forever,” because it’s never forever,’ he said. ‘We’re really talking about being on a path that will get us to the next point. ‘Bridge one: Stay as healthy as possible with diet and exercise and current medicine. ‘The goal is to get to bridge two. ‘Bridge two (is) the biotechnology revolution, where we can reprogram biology away from disease. ‘And that is not the end-all either. ‘Bridge three is to go beyond biology, to the nanotechnology revolution. ‘At that point we can have little robots, sometimes called nanobots, that augment your immune system. ‘Biology is a software process,’ Kurzweil told Maclean’s. ‘Our bodies are made up of trillions of cells, each governed by this process. ‘You and I are walking around with outdated software running in our bodies, which evolved in a very different era. ‘We each have a fat insulin receptor gene that says, “Hold on to every calorie”. ‘That was a very good idea 10,000 years ago, when you worked all day to get a few calories; there were no refrigerators, so you stored them in your fat cells. Kurzweil referenced a lab mice experiment at the Joslin Diabetes Center, which managed to turn off the mice’s fat insulin receptor gene. Rep. Steve Cohen: tea partiers are the ‘domestic enemies’ of the U.S. Please pay attention folks. These people are all jewish that propose enormous things at non-jew expense! Look into EVERYONE’S background and you will find a snake in the grass that robs, steals, deceives, rapes, pillages, plunders, etc. Their “god” is winning over the other humanities! If you read the bible, “their” god is a psychopath and a murderer. Christians have been so brainwashed it is ridiculous. White Europeans are deceived by “christianity” to love your enemy, turn the other cheek, give to the “poor”(fake poor), etc. Who wrote the story of Jesus? Jews…………………..stop the insanity and do some research for yourself. Ask questions. You have the knowledge at your virtual fingertips (never before in history) to ask and search and seek and get the history and information! Use the internet while you can, because the “snakes” are already hard at work blocking what you have access to! Get the facts and truth for yourself. Thanks Pakalert for awakening the masses, if only they will be open to the truth. The first Jewish converts to Jesus were persecuted to death by the Pharisees and Sadducees so your model is not correct. Read what Jesus said about the pharisees and those who say they are Jews but are not. Humans are murderers and psychopaths – don’t blame God . Since the Jews are to return to Israel from all over the world then something must happen to ensure this. but the covenant that God made will come true even if wicked men accomplish it. Cursewell is an elite. He knew the tech that was going to be intro’ed ahead of time because he’s on the science and technology board of the Illuminati. He’s not a predictor of anything. He’s a propagandist. “Ye shall not surely die” and “Ye shall be as God” is satan’s go to since the beginning. And people keep buying the same lie over and over. Cursewell is scared of what is coming after death. SO he wants to circumvent it. It will not help him. Ever wondered why it was called “Apple”? With a bite out of it? Think about it. oh ok…as if bad health is the only cause of death o_o…*sigh, my fellow human beings -_-. There is no way to avoid the curse of death in Genesis – our days are numbered before we are born – only God can change this. This is why we can see an early death even though that person has spent all their energy on health and harsh exercise and supplements. And someone who lives to a 100 just by eating God’s natural food taking no harsh exercise other than a walk and taking no chemical factory produced supplements. Jesus says give up all this worry and care and turn to Him. When will you leave this earth for eternity? You think you will live forever. Truth is you will live forever but not in the same body you are in now. Some will live a long life and others will have their life shortened. So what do you do with the days you have? The psalmist in 90:12 says “So teach us to number our days, that we may apply our hearts unto wisdom”. “How much better is it to get wisdom than gold! And to get understanding is rather to be chosen than silver”. Proverbs 16:16. Part of each day should be spent in searching God’s Word for wisdom and understanding. Too many Christians spend all their time on their job or some other activity that will not benefit them spiritually. The things you do each day will go with you into eternity. Whether you do things for the glory of God or you do them for your own preservation or pleasure. To get so involved in your work that you do not have time for God is foolish. To spend more time on things of pleasure than on serving God is foolish. You should make each day count for God and for your eternity.